I finished it as well. Some levels were tough. Especially the last one, but with unlimited lives is manage-able. It looks like it was inspired by the insalevs competitions. Actually, the secret level has one part that has exactly the insalev3 vibe. I'm looking forward to see the whole maps because by the look of it they may be even more interesting to observe from a distance to gather the bigger picture of what's going on. Also to read all the SGA texts as well. Thanks for the feedback, KeenRush and Roobar! Anyway, speaking of level maps, I just uploaded a map of the first level on KeenWiki (along with its special item): http://www.shikadi.net/keenwiki/File:Th ... vel_01.png I do have the rest of the level maps in my computer, but I'll upload those later since it's getting kinda late here. I finally beat it! These levels on the average are actually quite a bit harder than I initially perceived them to be. My favourite level I think is the third MM level (I love those icons by the way, looks absolutely like something from the Windows 98 era). The binary walls were really a clever idea. I like how they were introduced, with a chunk of them surrounding a point tile so that you have to think "there's gotta be a way into there, what is it?" And then how they're used in the rest of the level, not requiring you to know their "secret" but as a somewhat hidden quality-of-life improvement, I thought that was kinda cool. I was able to beat the level some other time, with a lot of enemy dodging and conserving every possible shot, and then I was able to make it to the machine with 1 shot left. I did find the secret point item in this level, by the way. I also thought the stylistic variation for the final level was cool. You can clearly tell right from the start, this is it, the core of the virus, the most corrupted part of the system. This level was devilishly difficult though. It takes some precision to pull off, and is highly random whether the Maltimer decides to move the 2 pixels necessary to bump you. But I thought this was kind of funny. The Tacks are extremely overpowered. Their high health and random behavior makes it impractical to shoot at them, but then they're so unpredictable that it's very hard to evade them. They can jump so high, they shoot so frequently, the shots being spawned higher makes them harder to avoid, and they can also just push you away. Any time I've come up against them, if I survived it was almost always due to pure luck. I think the concept of a shooting enemy that pushes you, and that you can stand on, is a neat idea, but these guys are so incredibly dangerous that I always avoided them whenever possible. I feel like they could be really cool to play around with if they weren't quite so deadly. Strangely it took me awhile to figure out I could shoot the Suerins, because of their visual resemblance to the Butler Robots from Keen 1. I have mixed feelings about the frequent use of the lightswitch in this mod. Some levels I wasn't even able to win until I discovered the location of one. My main gripe with it though is that turning the lights off makes the graphics not look quite as nice. I want to be able to see the new graphics as they are intended to look, and it's not as satisfying to have to beat the levels without being able to see all their unique visual things (such as the Mortrix machines) in full detail. I'm sure it's technically possible to beat it without messing with the lights, maybe there's some weakness to the Tacks that I missed, but I wasn't able to do so. Throughout the mod, I did find a few of the hidden points. I know I at least got the ones from Keen's Documents, Mortrix #3, and I think another one, maybe it was Mortrix #1? Sometime I'll probably do a replay and try to find all of them. Anyway, thanks for the feedback, proYorp! For ammo, when I was testing the mod, I tried not to mess with the Tackys for most of the time. I tried to make the Tackys weaker than the Vorticon Elites (which I felt like were rather too powerful) while still being a threat, although it seems that they're perhaps still overpowered. I guess making their shots equal to the level of Keen's shots wouldn't have been a bad idea. I probably also put too much of them in the last levels. That exploit in Mortrix #7 is rather funny. I thought that the Maltimer is too thick to make that possible, but I guess I was wrong. Oh well, at least it's just about a third of the level, and it does seem really hard to pull off. I suppose that it'd be a good trick for speedrunners. It is possible to beat the levels without using the light switches, although some can be tricky (I think Mortrix #7 would be the hardest). As I said before, I tried to get through the Tackys as safely and quickly as possible. I do agree that it doesn't feel so nice to see new graphics in the dark, although I suppose that's common in both Keen 2 and mods of it when levels are made to be very difficult without lightswitches (mostly thanks to Vorticon Elites and many of their replacements). The mod for the most part is indeed rather challenging, I'll say. When making this mod, I did wanted to increase the difficultly a bit as part of the experimentation. I tried really hard to make it feel fair, while providing some side-challenges that experienced players can decide to take on if they wanted to. 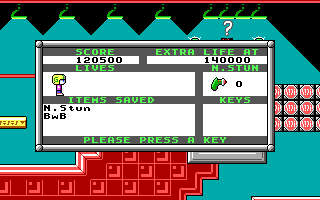 I actually made sure all of the levels can be beaten without using the pogo, collecting items (except for one Neural Stunner for the Mortrix programs), and shooting (again, except for the Mortrix apps). However, though, there were probably some areas where the difficultly was still too much. I think I focused more on refining the challenges involving tiles than those involving enemies (like the Tackys). In fact, when I think about it, it seems that people have been saying my stuff is quite challenging lately. So, I'll be sure to take some notes from the feedback next time I make a mod or game. It seems that next time I should use any dangerous enemies carefully and somewhat sparingly. In the end, I want to make stuff that I can enjoy along with family members, stuff that I'd love to see come to reality. That Super Mario level actually looks like a spin-off of Dangerous Dave in copyright infringement. At some point the Mario demo turned into Commander Keen after Nintendo declined the offer to port SMB3 to PC, so I thought it would've been cool to have Keen go through a place where he was a red Italian plumber. I paid very close attention to how the tiles are used in that video; I even ripped some of the graphics from that footage! Not much has changed between the beta and the final version, but I thought some of you might be interested in the videos.